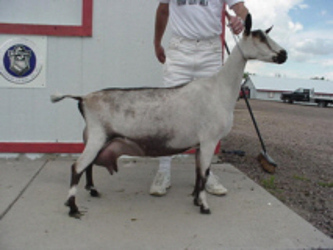 Cameo is a Gypsy and Bobby Socks style of doe. One of those pretty perfect Alex daughters. Cameo is very sweet and a talker. I had to just keep her when she was born. Cameo is a small doe with very little faults. 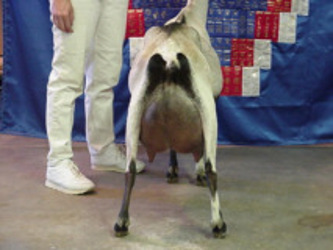 She has general appearance, dairy character, body and a top notch mammary. Cameo is smoothly blended through out. She has straight front legs and tracks very straight on the move. She was shown 3 times in 2000. Placing 1st every time and picking up a Reserve, a Grand and a Best in Show. If I were to fault cCameo, it would be her feet. She could use more depth of heel and tighter toes. Some may fault her for her size. But as I have said before, small dogs out live big dogs. See her sister Banjo.